Two rooms: One observing room with zip out roof, One sleeping or computer room. 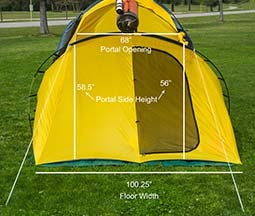 Vestibule: Located at end of tent with sleeping room. Extra guy line connections for security in windy conditions. 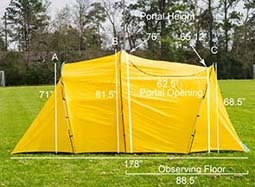 Inner tent material: Yellow, breathable ripstop Polyester. * with welding seam tapes on inner tent/flysheet. * with set-up instruction sheet. * with webbing handle style zippered carry bag.